Finum Paper Tea Filters, Extra Slim. The internationally renowned Finum filters are the world's most requested disposable tea filters. They give each tea enthusiast the chance to enjoy their tea in their individually preferred manner. Each size, has an especially long fill-in-flap, which makes it easier to fill in your tea. The flap is also used to fix the filter at the rim of your teapot by closing the lid. The Tea filters are made of abaca pulp, cellulose and sealing fiber. They are bleached with oxygen and are biodegradable. Includes 100 tea filters per box. Made in Germany. Extra Slim size makes up to two cups. Measures 3.25" long x 2.5" wide. Perfect for brewing our our world class loose leaf teas. Made in Germany. 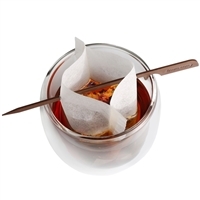 Finum Paper Tea Filters, Cup Size with Tea Stick. The internationally renowned Finum filters are the world's most requested disposable tea filters. They give each tea enthusiast the chance to enjoy their tea in their individually preferred manner. Each size, has an especially long fill-in-flap, which makes it easier to fill in your tea. The flap is also used to fix the filter at the rim of your teapot by closing the lid. The Tea filters are made of abaca pulp, cellulose and sealing fiber. They are bleached with oxygen and are biodegradable. Includes 40 tea filters per box. Made in Germany. Perfect for brewing our our world class loose leaf teas. Made in Germany. Finum Paper Tea Filters, Medium. The internationally renowned Finum filters are the world's most requested disposable tea filters. They give each tea enthusiast the chance to enjoy their tea in their individually preferred manner. Each size, has an especially long fill-in-flap, which makes it easier to fill in your tea. The flap is also used to fix the filter at the rim of your teapot by closing the lid. The Tea filters are made of abaca pulp, cellulose and sealing fiber. They are bleached with oxygen and are biodegradable. Includes 100 tea filters per box. Made in Germany. Medium size makes up to four cups. Measures 5.12" long x 3.94" wide. Perfect for brewing our our world class loose leaf teas. Made in Germany. Finum Paper Tea Filters, Large. Finum filters are internationally renown. The variety of sizes give each tea enthusiast the chance to enjoy their tea in their individually preferred manner. Our filter is famous for its unique true-flavor filtering qualities. They are made of abaca pulp, cellulose and sealing fibre. They are unbleached and biodegradable. The double-fold bottom of the filter provides the tea leaves enough room for their flavor to fully unfold. With a practical long fill-in-flap, which makes it easier to fill in your tea. The flap is also used to fix the filter at the rim of your tea pot by closing the lid. Perfect for brewing our world class loose leaf teas. Made in Germany. Length (including flap): 7-inch, Width: 3,1-inch.